Building Bridges to Peace has been an intrinsic part of the work of Hadassah for over 100 years. An outstanding current example of this ideal is two Hadassah nurses, one Jewish and one Arab, who work with a Non-Governmental Organization (NGO) called “Nurses of the Middle East”, which believes that Jews working side by side with Arabs breaks down barriers and changes perspectives. 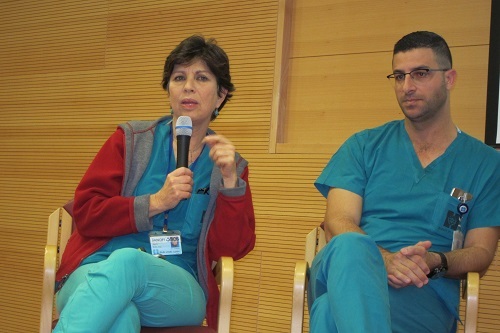 Julie Benbenishty,* is an Intensive Care Nurse at Hadassah who serves as the Trauma Nurse Coordinator at Hadassah Ein Kerem, and Acram Said-Ahmad** is both the Head Nurse in the Hadassah Advanced Imaging Radiology Department and a lawyer. When they are not on duty as nurses at Hadassah, they are volunteers for Nurses of the Middle East. Nurses of the Middle East seeks to encourage nurses to be ambassadors of caring and through patient care, creating communities of compassion & understanding. While political systems have built borders and checkpoints, they insure that care has no boundaries and carries no identification card. Through outreach, nursing exchange, education, and research, they build lines of communication throughout the region and the world. This network supports community and individual holistic health. The organization tries to facilitate medical services in Israel for Palestinians from the Palestinian Authority and Gaza. They work under the radar, making sure that as many applicants as possible do receive permission to receive healthcare in Israel. Unfortunately, of the thousands that apply from Gaza, very few are approved. They also share their knowledge with nurses in the Palestinian Authority and encourage further training. Acram explains that Arab society is male dominated, so a male nurse is a very positive role model. Today there are 24 Palestinian medical professionals being trained under the auspices of the Hadassah Australia Project Rozana. 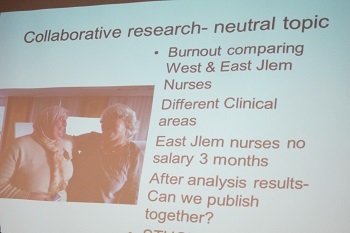 The work of Nurses of the Middle East was featured at the United Nations. *Julie Benbenishty has been a nurse since 1978 when she received her Nursing Diploma at the Hadassah Hebrew University School of Nursing. She also holds a Bachelor in Psychology from the University of Vermont / USA where she graduated in the year 2000. In 2003, Julie became Chairman of the national organization for Evidenced Based Nursing in Intensive Care and she also teaches at the Hebrew University. She is also an author who has published two books, “Disaster Management for Nurses” and “Autonomy of patients experiencing life threatening experiences”. **Acram Said-Ahmad was born in 1979. He is a trained law professional and a nurse in the Department of Radiology and Advanced Imaging. From 2003-2004, he was responsible for infection prevention in the Surgical Department of the Hadassah Medical Center. Acram is an Active board member of the NGO Nurses in the Middle East– optimizing nursing care in Israel and the Palestinian authority. He speaks Arabic, Hebrew and English.